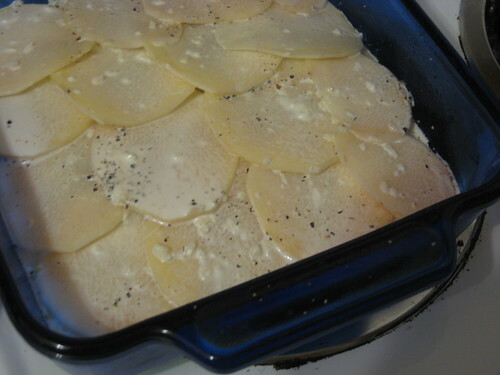 When it came time to vote for the November dishes for French Fridays with Dorie, there was one recipe on the list that I absolutely did not want to make: the potato gratin. It was not because I dislike potatoes (I adore them), or because the picture in Around my French Table is not appetizing (in fact, it is positively mouthwatering). No, I wanted to avoid this recipe because it looked too good, and I could not stop imagining myself shoveling spoonfuls of cream-bathed potato slices into my mouth. As it turned out, this gratin was the top vote-getter for this month, so I headed to the grocery store with a mixture of hunger and trepidation. When I got to the dairy aisle at Whole Foods and reached for the pint of heavy cream, I was overcome with diet guilt and I grabbed the light cream instead. "It's still cream, " I thought, "how much difference could it make?" Later, as we forked up tasty but not at all creamy potatoes, I admitted to myself that it made quite a bit of difference. I strongly suggest that you do not make this same mistake. If you are going to indulge in some potato gratin, you might as well indulge in the dish as Dorie, and the French, intended. 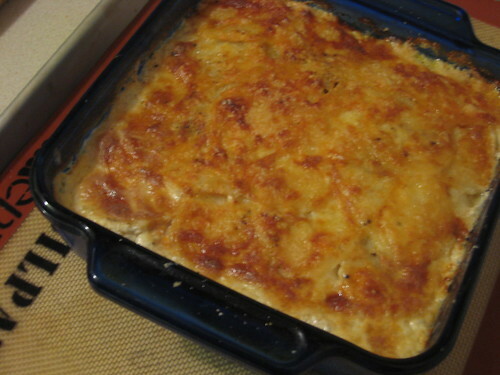 But as I said, even lacking the creaminess and the richness of the heavy cream, this gratin was still quite good. 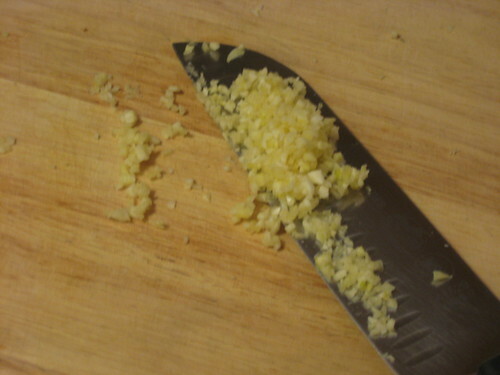 The garlic, which is simmered in the cream, infuses the whole dish and gives it another dimension of flavor. The melted Gruyere (an ingredient that I wouldn't even consider subbing with something low fat) was the highlight for me, as golden, crusted cheese has a tendency to be. Because light cream is not as viscous as heavy cream, the potatoes absorbed it all and melded together, resulting in a dish reminiscent of garlic mashed potatoes. This is not necessarily a bad thing, but it is really not want you want to end up with after peeling and slicing a pile a potatoes. I am definitely looking forward to trying this recipe as written; I have a feeling that a small piece of a rich and creamy gratin will be more satisfying than a bigger chunk of my "mashed potato" dish. If you want to try this recipe (and go all out with the heavy cream! ), pick up a copy of Around My French Table. Also, don't forget to check out which November recipes the other FFwDers chose to make this week. Thanks so much, Beth! I was on your site, and your photos are just gorgeous. Beautiful compositions. OK. I"m in. I was thinking of skipping this one but you make it sound good. Using the heavy cream is so worth it! Your browned beautifully. My girl and I just about finished this together. Heavy cream and cheese - who can resist? Good tip on the light cream. looks fabulous! It was not a recipe on top of any Weight Watchers list that's forsure! I went all out with the real cream and the cheese! I loved this recipe too and Im sure I'll make it again! Oh I feel your pain. This is one of my absolute favourite dishes! I keep it for special occasions. Steve and I often have it if we are doing a meal for our anniversary or Valentine's or Hogmanay or something - this, rare ribeye steak and a rocket and parmesan salad. One of our favourite ever meals. You have made me crave it now.